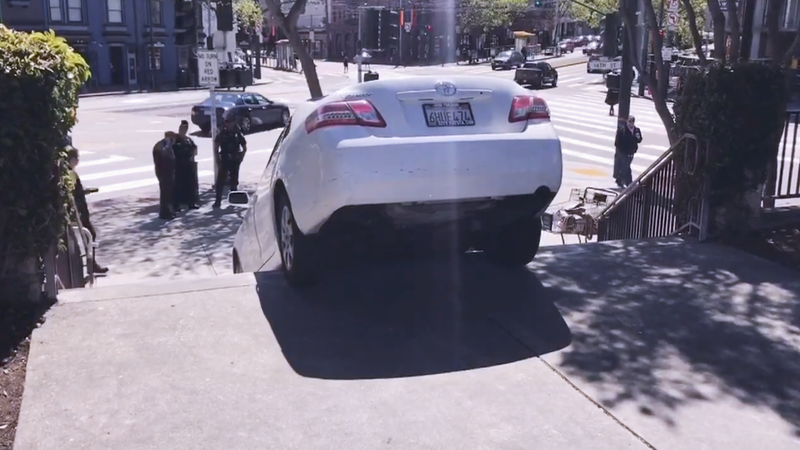 An Uber car took an ill-advised turn in San Francisco’s Castro district on Monday and ended up stuck on a concrete staircase with nowhere to go outside a Safeway supermarket. Per Business Insider, the white Toyota Camry got stuck on the pedestrian walkway at around 4:23pm ET (1:23pm local time), and “was driven by a human at the time of the accident.” The incident required unidentified “people at Safeway” to call in a tow truck that did not arrive for between a half an hour to an hour and a half after the incident, the site reported, and though a driver and two passengers were inside when it went down the stairs KRON4 reported no injuries. That driver, identified only as “Fred,” told Business Insider that Uber’s GPS app told him to go down the stairs. But a Google Maps view of what appears to be the scene of the accident makes it fairly clear that while there could have been a more visible no exit sign or something, there are plenty of context clues of the “don’t go this way” variety including a pedestrian crosswalk, yellow paint indicating a pedestrian curb ramp, the curb itself, and trees and other obstacles directly ahead. To be fair, this kind of thing happens to me all the time, though typically while playing Grand Theft Auto V.
Do keep in mind though that while this particular accident may rate as a nothing-burger, Uber has an unclear safety record, tries to avoid liability from driver-caused mishaps, and still expects the public to trust it to run fleets of autonomous vehicles.